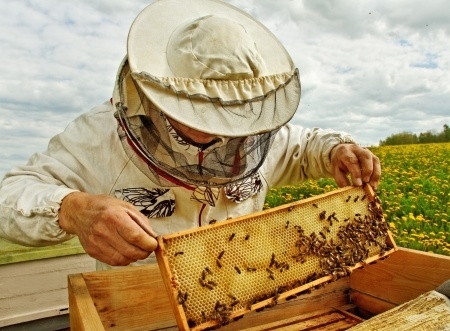 Down in New Zealand, there lives a young beekeeper named James Malcolm who has dedicated himself to his profession. Malcolm, 28, lives on his worksite of the beekeeping operation he owns, working 12 hour shifts without complaint. He’s been doing this for a while—at least a decade—and he is starting to see all his hard work pay off. Ten years ago, Malcolm completed a Diploma of Agriculture at Lincoln University and was working with his father on their family’s farm operation until he met a local beekeeper. “I was standing in front of these beehives one day and was amazed and curious to know what was going on inside those boxes. I’ve always been interested in interesting things,” Malcolm said. He began working with a local apiarist one summer, and it was there he grew his interest in beekeeping. He felt there was much to gain from the honey industry with his cropping background, seeing the importance of bees to a farm. “I took the knowledge from my farming background and study and crossed it over because there are so many parallels. Beekeeping is a long way behind but catching up quickly with genetics, diet, feeding, and environment, but there hasn’t been a focus on technology until now.” Initially, Malcolm was given ten beehives, and he eventually bought another 100 over ten years. He then split and expanded his stock by 50 percent a year to get his 3500 hives. Malcolm admits how difficult this would’ve been while caring for a family of his own. “I wouldn’t be able put all the profits back into the business the way I have. It’s been about getting to a target at a certain point in time because I knew there was opportunity to be realized.” The ten-year beekeeper now owns and runs Natural New Zealand Honey Ltd, which operates in North Canterbury. In addition to his 3500 hives, he has a beekeeping HQ and 16 full-time staff members. The company has a philosophy of “train and retain,” and several of the employees are on an informal apprenticeship. After his years in the business, Malcolm believes a happy workplace is a productive one. “Our workforce is a random mix of very smart people with common interests—the outdoors, bees, nature. They have skill sets that complement each other. And everything we do is based on open forum discussion. The type of person we are looking for is well rounded with a lot of different skills. They don’t all need to be the same.” Like a beehive, oddly enough.